You may have invested a lot of effort and time in the SEO of your website. You may also have taken the steps of ensuring that the website is filled with valuable content and information that your visitors will be looking for. However, you may still find that most of your visitors are vanishing without a trace. You are obviously going to lose a lot of business if you are unable to convert your visitors. On the other hand, your visitors will not be willing to commit further if they do not have a good experience with your website. The only way to ensure a good turnout of visitors is to go for a website with a good user experience. User experience or UX is simply the experience that the user has when using a particular website or system. UX will address all the different facets of a particular service from the view point of the visitor or consumer. There are many reports and statistics that show that the need for a good user experience is on the rise. More than 60% of visitors leave because the UX was not a good one. Almost all of the UX issues can be solved through testing. Most people will tell others when they have a bad experience with a particular site. The majority of people will make their decisions of future purchases based on the experience they have during the first time. User experience encompasses a wide variety of issues. Most of them can be easily categorized into a few elements. It is the look and feel of the user interface you are using for your website. You should use visual elements to convey a specific message to the users along with the information they required to reach a decision. Visual design is a crucial component of user experience. The information present in your website should be organized. A proper architecture and hierarchy of information can help the user get hold of the necessary data within the shortest period of time. The grouping of the information should be done meaningfully. Labels can be used for the purpose but they should be relevant to the content they are being placed. Improve the navigation so that it becomes easier for the user to get hold of the necessary data. Add the necessary details in the descriptions. You should find out what your visitors want and then get it implemented in you website. Interaction design involves the assessment of the needs of the users and then incorporating it accordingly. After that, you can proceed to designing the interface based on the possible behavior of the user. Once done, you should ensure that the design is consistent throughout your website. 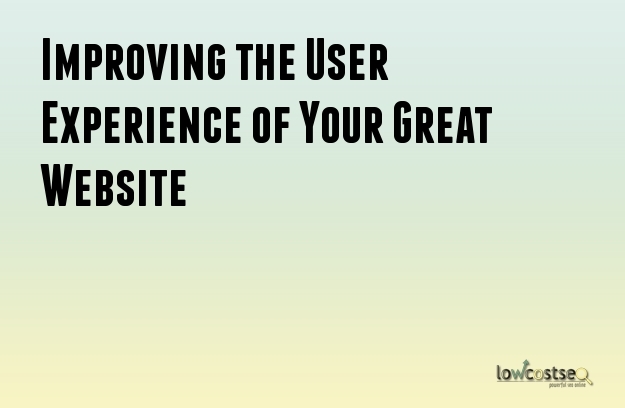 Through user experience you can increase the usability of the site. You will not only get return visits from your customers but also attract new visitors.